01: Tamara Jurdi X 02 Pax (Lebanan). Cultural Tour Kathmandu, Pokhara and Chitwan National Park. 10 Jan 2015. Comments: This company is top notch. They provided all the information we needed to prepare for this 2 week in Nepal. We were greeted at the airport and taken to a beautiful hotel. The trip was fantastic with guide. The food and accommodations on the trip were top notch. All in all a great time. I would highly recommend this company for any trip needs. 02:Farida & Alia Mortada (Wildguanabana) X 02 Pax (Egypt). Ghorepani Poonhill trekking. 12 Jan 2015. Comments: Adventure Treks Nepal made our trip in Nepal unforgettable ! 03:Anna X 03 Pax (Swiss). Cultural Tour Kathmandu and Pokhara. 31 Jan 2015. 04: Line X 01 Pax (Norway). 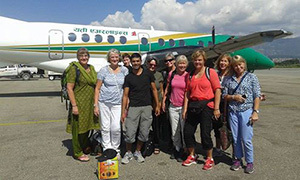 Cultural Tour Kathmandu, Pokhara and Sarangkot. 16 Feb 2015. Thank you again for an unforgettablecultural tour and sarangkot Hikking. 05: Purshouse X 03 Pax (UK). Ghorepani Poonhill trekking. 20 Feb 2015. Just wanted to say had a fantastic trek, both Sangam Dev and Purna were superb. Professional, informative and above all good company. A Nepal is a most amazing country, We came primarily to see the landscape and mountains but my memories are in fact of the people. 06:Randi X 01 Pax (Canada). Darjeeling Tour Trekking. 10 Mar 2015. Comments: First I had an incredible trip and way too short. I want to tell you that GD was incredible in taking care of me and making sure the trip went well. I did not realize how steep the hike was to Sandakphu and he was very kind and patient. 07: Megan X 04 Pax (Australia). 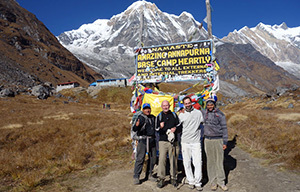 Annapurna Base Camp Trekking. 12 Mar 2015. Comment: My sister niece and friend decided to book our trek with Adventure Treks Nepal after being recommended by a work friend. We never regretted this decision from the moment we first made contact to start working out what trek we would do. Gyan always responded promptly to our emails and helped us to select the Annapurna Base Camp Trek. We arrived on 12th March 2015 and the adventure began. We were met at the airport by our guide Gyanendra who would become a friend by the end of our time together. Our trek was an amazing an experience we will never forget. It was challenging at times both physically and mentally but Gyanendra and our assistant guide Mr Bohd and our porters Mr Khil and Mr Dhev were incredible. They would so supportive and we always felt they had our best interests were at heart. 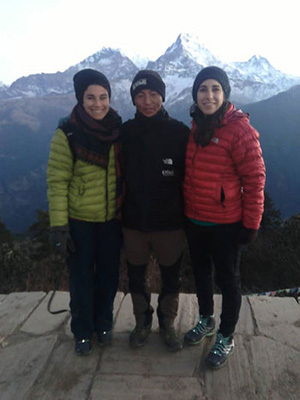 Gyanendra had such amazing knowledge of the region we were in and had such a connection with the people on the mountain- we felt like we were amongst friends. There were times where our itinerary needed to be slightly adjusted and it was never a problem. Gyanendra always made us feel safe and were looked after every step of the way. I would HIGHLY recommend Adventure Treks Nepal. I am writing this testimonial after the devastating earthquakes our hearts have been breaking thinking our friends in Nepal are suffering so much. We are planning to visit again in the next year or 2 and wouldn't hesitate to book again with Gyan and Adventure Treks Nepal. 08 Li Feng X 03 Pax (China). Cultural Tour Kathmandu, Pokhara, Sarangkot and Nagarkot. 21 Mar 2015. Adventure Treks Nepal organized us an amazing Trekking tour. Our Dream was coming true and we had an unforgettable Adventure. Thank you Gyan for the helpful information. Thank you Bhuwan for the safe guiding and nice time during the Trekking tour. We can recommend Adventure Treks Nepal. 09:Neil X 01 Pax (Italy). Ghorepani Poonhill Trekking and Chitwan National Park. 25 March 2015. Comments: "I have used Adventure Treks Nepal over the past four years, for treks around Everest base camp and the Lantang Heritage trail, Arun Vally and Tamang Heritage Trekking. They provide a good service to clients, have a broad range of programmes at competitive prices, and importantly for me, they treat their employees well. I would highly recommend them. This year I have done Ghorepani Poonhill Trekking with same Experience. 10: Tore and Ann-Marie X 02 Pax (Sweden). Mustang Trekking. 29 March 2015. Comments: Thanks again for a superb trekk to Mustang! We are so happy with the arrangement, our guide Lalit and our porter Purna. The trekk will be a memory for lifetime and we will without doubt recommend Adventure Treks Nepal to our friends in Sweden. Lalit gave us his phone number and we have tried to reach him but it doesn’t work. Please send us his number with country code and so on. 11: Olivier Mischa X 02 Pax (Sweitzerland). 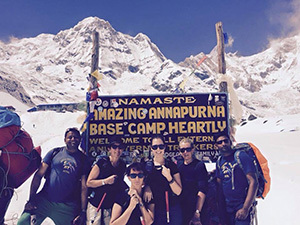 Annapurna Base Camp Trekking. 30 March 2015. The trek itself was wonderful. The walking was tough but the views were all worth it. The lodges & places we walked through Gave a real sense of Nepali life and we so welcoming at the end of each days trek. The service provided in terms of airport pickups and other support was absolutely spot on. Excellence all sound. The guide and the porter that we had were just fantastic and I will never forget their friendship and most of their smiles. 12: Kjell Borneland X 02 Pax (Sweden). Cultural Tour Kathmandu, Pokhara and Chitwan National Park. 01 Jan 2015. This is to thank Mr Gyan B. Karki for all the services rendered by company Adventure Treks Nepal in the successful conduct of Since 2001. co-operation between Swed-Asia Travels and Adventure Treks Nepal in travel business to Nepal, Bhutan and Tibet. Do not hesitate to contact Adventure Treks Nepal. 13: Frances X 02 Pax (Australia). Annapurna Circuit Trekking. 04 April 2015. Comments: "My husband and I had such an amazing experience trekking the full Annapurna circuit in Nepal in April 2015. We organised the trek with owner Gyan Karki prior to arriving in Nepal and have to say he was most helpful every step of the way with all our questions being answered immediately and nothing was too much trouble. I'm not sure we could have done the trek without the services of our guide Khim and porter Man; they were both very experienced, very helpful and very patient when I was a bit slow at times. Khim looked after us very well, organised all our teahouse accommodation, including blankets, so we were free to just enjoy each day and explore. The scenery was just spectacular, we couldn't take enough photos and each day was another amazing view. We were also much happier using a local trekking company, thereby keeping the money in the country. We highly recommend a trip to Nepal and we would thoroughly recommend using Gyan and his team at Adventure Treks Nepal for all your trekking/holiday needs." I hope this will be helpful for your next lot of travellers. I think for us now it will be very hard to top this trip, it really was an experience of a lifetime. 14: Jeff X 04 Pax (USA). Manaslu Trekking. 02 April 2015. 15: Steve X 09 Pax (UK/INDIA). Cultural Tour Kathmandu, Pokhara, GHorepani Poonhill Trekking with Chitwan National Park. 04 April 2015. We really thank you to give me an outstanding experience.We know you always try to make us happy when we were in trekking! Staying in mountains reminds us of your smile. We believe this trekking remind in our mind for long time. 16:Janine X 01 Pax (USA). Cultural Tour Kathmandu and Pokhara. 05 April 2015. I enjoy this trip very much. Nice people , friendly people, beautiful places; sweet and good memory! 17: Peter X 02 Pax (UK). Ghandruk Trekking with Chitwan National Park. 05 April 2015. Comments: In regard to our testimony...'The service was great from start to finish. Dev our guide, made our trip a memorable one and made us all laugh along the way. The hotels/tea lodges and food were all to a good standard and the views of Annapurna were beautiful. Finishing in Kathmandu finished the whole trip off nicely. 18: Beata X 02 Pax (Poland+Sweitzerland). Cultural Tour Kathmandu and Everest Trekking. 07 April 2015. Comments: This has been one of the best experience we ever had. This will not be the last time trekking in Nepal. We loved Khim. He had treated us andd everybody with the utmost kindness. 19: Saowanid X 11 Pax (Thai). Langtang Gosainkunda Trekking. 09 April 2015. Comments: "The service level of our guide was extra ordinary ! The company of our guide Porters and driver were pleasure in Nepal. That's why this it our 6th time in nepal using the same company & Peoples . Our nest destination will be annapurna Base camp " . Walk ‘N’ Yoga. 10 April 2015. Comments: Many wonder how some are capable of traveling solo to explore unknown places in the world. I wondered the same, until I did that myself. My travel experience has opened my eyes to the most exotic places; from the surreal beauty of the Salar in Bolivia, to the most beautiful mountains in Nepal. It does, in fact, seem scary to simply just throw yourself out there alone with complete strangers. But, aren’t we all strangers in a strange land? It took me some time to recognize that and to be able to comfortably, without any hesitations, strike a conversation with a stranger. Now, it seems like second nature. We are all on the same boat. Everyone is just like you, alone in a strange place and looking for others to be with. Hence, you are never really alone. My Walk ‘N’ Yoga trip was one like no other; on the 10th of April, my spontaneity pushed me to go for it and I am truly grateful for that. I have met the most interesting, diverse and most compassionate people, which makes me fall in love with WG more and more everyday. It teaches me to get more comfortable being uncomfortable, more confident being uncertain and it pushes me to make room in that area between my can’ts and cans. I have encountered amazing people who have gone out of their way to help me and will, without a doubt, have a great impact in shaping my life. This old saying says it all, “you can always depend on the kindness of strangers”. When you simply get lost with an open heart, unexpected goodness will happen. There is nothing more beautiful and uplifting than getting lost in the midst of the Himalayan snow peaks, deep river valleys and beautiful waterfalls, doing yoga with people who share the same passion as you: being alive. Malak El Ayouty (One of our client). 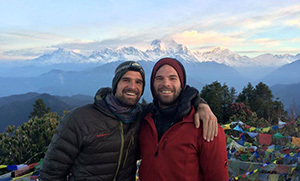 "Last April we went on a Life Changing Walk 'N' Yoga trip to Nepal where we walked, trekked and hiked through mountains and breathtaking scenery from Pokhara to Dhampus and Sarangkot. We had Ashtanga yoga sessions and meditations that took from and added to the surrounding beauty of the mountain peaks around us! We have missed this breathtaking country so much and this October we are going back to Nepal on yet another Walk 'N' Yoga trip !" 21: John X 02 Pax (USA). Everest Base Camp Trekking. 15 April 2015. I just wanted to let you know that you did an amazing job planning and organizing our recent trip to Nepal (Everest Base Camp Trekking) Everything went flawless. The people we met were nice and very open to us and were easy to talk too. The scenery and various landscapes we saw were assume. Everyone in your company from our driver, Guide/Porter and Gyan himself were excellent and treated us with great respect. We could not have asked for anything better. We will have no problem giving good referrals to you and your company. You all are very professional. 22:Grant and Brett X 02 Pax (USA). Everest Glimpse. 15 April 2015. 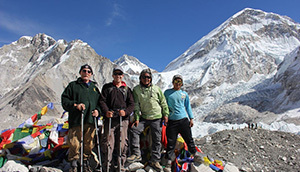 Comments: we have just returned to USA from a fantastic trekking tour to Everest Base Camp and we are very grateful to the team from Adventure Treks Nepal, the porter and the guide were very professionel, helpful and kind. 23:Laura X 05 Pax (Uk/Australia). Everest Base camp Trekking. 20 April 2015. Comments: We just want to say on behalf of the five of us, what a great trip to Nepal we had all of the arrangements went really smoothly, all the organisation was spot on it was great to see Kathmandu, and we enjoyed seeing the temples with our guide and the main trek with Sangam and Porter were brilliant - though hard work of course ! So thank you for everything, and we hope you continue to have this kind of services for future treks like ours. 24:Ciocci X 01 Pax (Italy). Everest Base Camp Trekking. 22 April 2015. Comments: The Pick up was Excellent. Gyan was very professional. All the Staffs Included Guide & Porte were very nice. Very impressed with the service of Adventure Treks Nepal. Would recommend friend and associates. 25: Penna Stefano X 02 Pax (Italy). Upper Mustang Trekking , 01 Aug 2015. 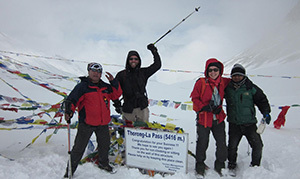 Comments: "Our personal experience with Adventure treks Nepal was excellent. Our trip was very well planned in every single detail. Our personal guide Gyanendra Karki is an extremely reliable, professional and very nice person. He's an excellent and experienced guide. In Kathmandu he guided us around the most important historical sites telling us everything about the religious monuments and places. He's really well prepared and organized during the tours. He also has a very good knowledge of all the local traditions and local people. During the trekking in the mountains we always felt very secure and comfortable. He's very responsible and at the same time he does all he can do to satisfy clients' necessities. He always chose the best accommodation for us being very careful to satisfy our needs. We really have to thank Gyanandra for making us live a unique experience in Nepal"
We do hope to come back to Nepal soon! 26: Stephan X 01 Pax (Australia). Annapurna Circuit Trekking , 06 Sep 2015. 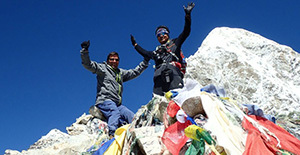 Comments: We had a very good experience with Adventure Treks Nepal. 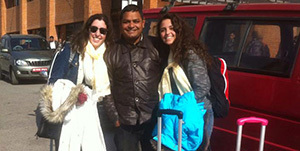 Gyan helped us to plan a very good trekking tour in every detail. Both the guide and the porter were extremely relaiable and professional. Gyanendra is a very nice person and an excellent and experienced guide, who made us feel very secure and confortable in every sigle moment of the trekking. They always choose the best accomodation for us and they also cooked sometimes very good dishes when in the lodge there was no cook. If we had to organize another trekking in Nepal we would certainly repeat the experience with Adventure treks Nepal. 27:Cheryl X 02 Pax (Australia and Newzeland). Mardi Himal Trekkinging Paragliding Hikking , 20 Sep 2015. Comments: I highly recommend Adventure Treks to everyone! Gyan (owner) was great to communicate with before we got to Nepal and he even met us at Tribhuvan airport. My partner and I trekked the Mardi Himal with guide Bhuwan and porter Khil. The trek was wonderful and quiet as we only saw 4 other tourists along the 6 day walk. We were grateful to visit tea houses along the way and we quickly realised that tea and biscuits make the day's problems disappear! Tea houses offered delicious meals, were warm and dry, and equipped with basic facilities. We enjoyed the stories that our guide told us and the local knowledge he shared. Both Bhuwan and Khil always looked out for us - from bringing our boots inside at night (when we forgot)... to holding my hand while walking across a waterfall... to suggesting food we should avoid while walking... and many more situations that we relied on them! We filled our afternoons/evenings with playing cards which was so much fun. I injured my leg on day 3 of 6 and we discussed options of what to do next. The itinerary was flexible and we ended up finishing the trek a little earlier than expected - Both Bhuwan and Khil were very supportive. My partner and I were very sorry to say goodbye but we look forward to reaching out to Adventure Treks should we visit again. 28: Anna X 02 Pax (Police+British). Everest Base Camp Trekking , 02 Oct 2015. Comments: I would like to take this opportunity to say thank you very much to Adventure Treks Nepal to show me the most amazing sites of this beautiful country and look after me during the trek to Base Camp. If you want to experience incredible adventure choose Adventure Treks Nepal. Annapurna Base Camp Trekking , 03 Oct 2015. Comments: I made a very Nice trek to ABC with my son in October. Good guide Kim very thoughful and efficient porter Vishnu. Correct lodges , good local food and nice weather. Waln'n Yoga, 03 Oct 2015. Comments: We had a really great time in Nepal, we saw so many nice things. The trip was great with a very competent guide! Everything was well organized, we had good food, good beds, and the sleeping bags were really useful! Impressive landscapes, beautiful nature ! Our guide, Bhuwan was very helpful, and could nearly answer all our questions. 31:Gunilla X 07 Pax (Sweden). Ghandruk/Mardi Himal Trekking, 06 Oct 2015. At last writing to you with some remarks on our journey this October. With some distance we still have our memories of it vivid in our minds. Although we came in a troublesome time with the blockade causing unreliable transpors and the country still recovering from the earthquake we had a very good time and an interesting trip without ever worrying about practicalities. We felt very well looked after by you and all of your staff. We think it was good that we were a small group (4 persons) and that our trek was varied with different terrain and views. We like that we both walked among people's everyday life in villages and a bit higher in the mountains with other kind of views of nature. Some favourite stops; Astam Eco Village, where it would be nice to have stayed and maybe take part in their program. We were impressed by Lower Camp that was very clean and well kept. Hopefully the new place on High Camp will help raise the standard over there. Louang on the way down was a very nice alternative to the original plan. You should consider making that route the first choice. Something you could make even better is the information before, especially to first time visitors. The fact that how much and what you will see is not all about altitude, sometimes you get better views from lower ones. The low standard of some of the lodgings was also unexpected. It's important to avoid misunderstandings. We expected to trek higher and Gunilla and Maria could have done so. All of our group would have liked to spend more time walking per day. Perhaps it's better to ask future customers about how many hours per day they wish to walk instead of only asking about what degree of difficulty they think they can manage. 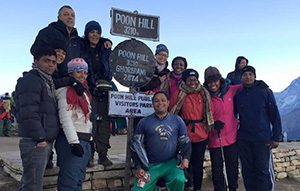 We had a terrific trek in spite of mixed weather conditions, much thanks to Bowan, Kushal and Khit. We got more than help with finding our way and transportation of our stuff. We learned about the nature, the places we passed and how life is led there even all the way into the kitchens to see how the food is cooked. We appreciate that we could talk about many things. The selection of spots to see in Kathmandu was nice. We appreciated the guiding from Bowan and his help to check up the messy times of flights. Hoping you and your team are all well with things working out for you, and that you can have some use of our comments! Until the next time, many best wishes! 32: Lena X 01 Pax (Sweden). Kathmandu Pokhara Cultural Tour, 10 Oct 2015. Comments: Keep it up! What you're doing is great. Quick response on E-mail inquiry. Very excellent guide. Thanks! You made my trip ! 33: Kwie and Matt X 02 Pax (USA). Annapurna Circuit Trekking , 01 Oct 2015. Comments: I was incredibly please by the multitude of details Gyan Karki (owner of Adventure Treks) covered for this trek. He personally greeted us at the airport, arranged lodging and assigned a responsible, capable, and attentive guide and porter, always a joy to be with for our 18-day trek. The guide spoke English well, quickly immersed us into the culture and knew most of the names of the mountains, fauna, and flora. Our trek was hugely enriched by the local knowledge of our guide and porter. Gyan met us at the airport, introduced us to our guide and porter, arranged transportation and lodging to and from the trailhead plus an excursion to one of the National Parks and personally returned us to the airport at the end of the trek. provided experienced and friendly staff for trekking (and duffel bag + T-shirt). By the way: Please, do NOT overload your porter. A porter carries the duffelbags for 2 trekkers. If unsure how much to tip porter and/or guide, check for online advice, or better yet, ask Gyan. 34: Paul and Pam X 02 Pax (USA). Everest Base Camp Trekking, 28 Sep 2015. Comments: We decided to use Adventure Treks Nepal for our trek to Everest Base Camp after reading positive reviews. Our communication prior to our trip was with Gyan, mostly through emails. After several emails back and forth, we wired our deposit money and crossed our fingers that this company really existed. Prior to our trip, we had to change some of our plans and contacted Gyan with some alternatives. Gyan responded with suggested changes to our itinerary almost immediately. When we arrived at the airport in Kathmandu with our delayed flight, Gyan and our driver were waiting and found us right away. Gyan took care of all aspects of our trip, made sure everything went smoothly, confirmed our stay while in Kathmandu before our trip and went over and above the service that was to be expected. While on our trip, we came to understand how important it is to go with a reputable company. 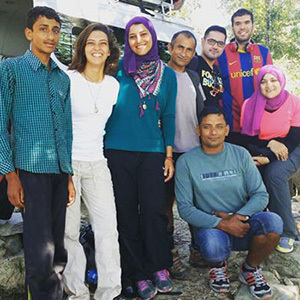 With another group through Adventure Treks Nepal, they were in need of medical assistance. Gyan was there to coordinate their helicopter evac while assisting us in speeding up our climb as the weather was to start to turn. We completed our trip to base camp early because we wanted to beat an approaching storm. Our guide assisted us and recommended a plan to achieve this. We had beautiful weather until our return into Lukla. Because we finished ahead of schedule, we had extra time. We decided on a trip to India. Again, Gyan helped us to plan this trip. The service of Adventure Treks Nepal is over and above ones expectations. We felt as though we were their only clients. Adventure Treks Nepal is a service-oriented company that can be trusted to provide great service, great guides, great porters and a great driver. The company is very reliable and accommodating to ones needs. Gyan's communication and quick responses to emails assures confidence and trust. We had requested a few extras during our trip and Adventure Treks Nepal delivered on every one of them. We will be returning to Nepal and will definitely use Adventure Treks Nepal again to help us with our visit. 35: Antoni X 02 Pax (Belgium). Annapurna Base Camp Trekking , 12 Oct 2015. Comments: Just to let you know that we had a wonderful trip. Khim was a wonderful guide and was friendly, courteous and extremely knowledgeable about the areas we visited. He was very accommodating and flexible to our needs and his command of English was excellent. Thank you again for a wonderful trip and hopefully will see you next year for another trek. 36: Michel X 01 Pax (Canada). Annapurna Circuit Trekking , 17 Oct 2015. Comments: Very reliable organisation, good guides who adjusted the program to fit different capacities. We had great fun and felt well taken care off- can deffinitly be recomended! 37: Gabriella X 02 Pax (Italy). Jomsom Muktinath Trekking , 02 Nov 2015. Comments: A massive thanks to Gyan Karki and all the Adventure Treks Nepal's. Hiring you was one of the single best decisions we made during the entire planning stage of this project. It quite simply could not have happened without your skill, determination, support and professionalism. We all owe you a debt of gratitude and wecould not recommend your services more highly. 38: Michel X 01 Pax (Canada). Gosainkunda Trekking with Chitwen National Park, 08 Nov 2015. 39: Adriano X 03 Pax (Italy). Everest Base Camp Trekking, 08 Nov 2015. Comments: Adventure Treks Nepal (Bhuwan Karki) organized a well rounded tour; with sightseein and Everest Base Camp. Everyone involved was friendly, helpful, fair and fun. Traveling with them is a great way to help the economy and keep these wonderful people employed. And it will be an amazing trip too! 40: Dominika X 02 Pax (Poland).Gosainkunda Trekking, 14 Nov 2015. Comments: This was our third time in Nepal and third time with Adventure Treks Nepal! So, it must mean something! :-) We do appreciate reliability and friendly approach. PS. Special thanks to our guide Gyanendra! 41: Nayi X 03 Pax (USA/Romania). Everest Base Camp Trekking and Bhutan Tour with Chitwan National Park, 08 Nov 2015. 42: Dean X 02 Pax (Australia). Jiri to Everest Base Camp Trekking, 06 Nov 2015. Comments: I'd be more than happy to provide a testimonial for your website. "Organising my trek through Adventure Treks Nepal turned out to be an excellent choice. Gyan was excellent at communicating through Email and he organised our trek perfectly and exactly how I wanted it. Dev, our guide, was very friendly and helpful and we were taken care of for the entire trek, along with our porter, Kil. In total we trekked for 24 days from Jiri to EBC via Gokyo and the Cho La Pass. What a trek! This is truly one of the most beautiful parts of the world. I couldn't be happier with the ways things went and that is thanks to Adventure Treks Nepal. I'll definitely be booking my next trek through them." I also put up a review on Tripadvisor. I hope it helps to bring in more customers. Will recommend you to anyone I come across who is interested in trekking in Nepal. 43: Bruno X 01 Pax (France). Annapurna Base Camp Trekking , 03 Dec 2015. Comments: " J'ai organisé mon séjour au Népal avec Adventure Trek Nepal en 2015 en les contactant directement sur leur site web. J'avais peu de temps pour mettre tout en place. Ils ont été formidable et professionnel pendant mon séjour. Mon trek jusqu'au Camp de Base de l'Annapurna restera un moment inoubliable grace a Adventure Trek Nepal." 44: Mr Samra X 03 Pax. (Egypt and Turkey). Paragliding, Rafting and Hikking , 27 Dec 2015. Comments: Gyan and Adventure Treks Nepal were amazing during our recent visit to Nepal! We have no hesitation in recommending them, and highly encourage others to support to this local business!! 45: Steve X 02 Pax (USA). Chisapani Nagarkote Trekking , 29 Dec 2015. Comments: Adventure Treks Nepal organized my and my son's trip around Kathmandu. ATN took care of every detail, Our Guide was very helpful and really nice. I intend to have ATN organize one or two more treks for me in Nepal. 46: Harry X 03 Pax (Australia). Everest Base Camp Trekking , 0129 Dec 2015. Comments: Myself and my two adult son's completed the Everest Base Camp Trek during the period Dec 2015 to Jan 2016. In a word it was FANTASTIC. We were recommended Adventure Treks Nepal by a friend who has now done two treks with them and is hoping to complete a third in the near future. From initial contact with Gyan nothing was too much trouble and all questions were answered promptly with, good to know, information. Our trekking experience was Gyan's primary consideration. From the moment we cleared customs in Kathmandu he was there to see us to our hotel, talk us through what to expect over the next two weeks and ease us into the hustle and bustle of busy Kathmandu. Our guide Lalit and porter Bikas are great guys. Full of energy, big smiles and always ensuring that the trek was informative, but above everything else was fun. They got the Australian sense of humour and understood the need to keep my two sons challenged and so, were always flexible to change the itinerary and add extra experiences when the opportunity presented its self. We found trekking during winter was not an issue, in fact it came with very distinct benefits of almost no crowds and the feeling that you were sharing the mountains with just yourself and the locals. We thought this definitely enhanced our cultural experience. Nepal is a very poor but beautiful country. The earthquake of April 2015 has brought great financial hard ship to many Nepalese people and tourism has suffered as a result. It seemed obvious to us that we should book our adventure with a local operator and so, ensure that at least our tourism dollars are staying in Nepal and providing maximum benefit to the locals. It is impossible to trek the Himalayas and not be inspired by its beauty and grandeur. Adventure Treks Nepal definitely enhanced our experience.